There is nothing more frustrating when your heating system is not working correctly or even worse, your boiler broken. But if you smell gas then there’s it could be a more serious problem than you think. If you smell gas and can’t find the source straight away call the National Grid gas emergency line on 0800 111 999. Even if you don’t smell gas, but your boiler is broken down then do not try to fix it yourself. Working on gas boilers without the proper experience will not only will invalidate your warranty but it could be fatal. There are many qualified Gas Safe engineers who can help if your boiler is broken. Are there any noises coming from your boiler, like tapping, banging or clanking? If you have an issue with your gas supply the easiest way to check if you have a problem is by checking if other gas appliances are working, like your cooker. Also it’s a good idea to speak with your neighbours to see if they also have a problem. If your boiler is broken you can check your gas stopcock. If it’s switched on and you have no gas coming through then it could be a gas supply problem. Contact your gas supplier to check if there is an issue in your area. Do you have an issue with your power supply? If there is an electrical issue you will be unable to ignite your boiler so check that your boiler is plugged in. Most modern boilers have a digital or LCD display, does it look like it’s on? If there is a power cut then your boiler may have reset. Check the clock and if your preferred settings are correct. If your boiler is broken due to a power issue, try pressing reset and then leaving it for ten minutes, then try switching it on again. Is your boiler still not working? Is your water supply turned on? If your boiler isn’t working and your water is turned off then you will lose pressure in your boiler system. Check your taps, is water on in the rest of your house? If not then contact your water provider. Is your boiler broken but you can’t find the fault still? One option would be to check the thermostat controller and check it’s in the on position. If it’s a timer-based system then make sure that the clock is correctly set. Another thing to check is that the thermostat is set above the room temperature. What’s the boiler pressure set to? Sometimes the boiler water pressure can fall below or go above the minimum requirements. The usual central heating pressure setting for modern boilers is 1.0 - 1.5 bar, so check the gauge on your boiler to see if this is your problem. If you are under or over pressure then you can find how to pressurise and bleed your boiler in your boilers manual or check this guide. If pressure isn’t the problem check with your gas supplier or call a Gas Safe registered engineer. Are you having the issue in Winter? Sometimes when it’s very cold outside the condensation pipe can freeze up causing your broken boiler to automatically shutdown as a safety precaution. Although you can pour hot water onto the end of the pipe to defrost it, we suggest calling out a Gas Safe engineer to take a closer look. The DIY approach will work but it’s only a short-term fix and is likely to reappear as a fault. Are you still struggling with your broken boiler? If you still having issues then it’s time that you call out a professional to help. Any qualified Gas Safe registered engineer should be able to get you back up and running quickly, saving you one less headache. 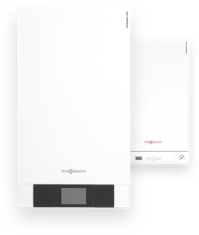 Find a local Viessmann installer.